This fresh and funny story is about imagination coming to the rescue. Monsieur Saguette, on the way home from buying a baguette to eat with his soup, uses his imagination to help himself -- and others -- in times of need by transforming his ordinary baguette into something extraordinary! A cat up a tree? No problem once our humble hero wields his trusty, crusty baguette. An alligator on the loose from the zoo? A robbery? A stalled parade? 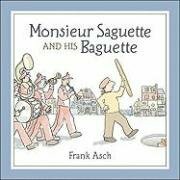 No challenge is too great or too small for Monsieur Saguette and his amazing baguette. But what will happen when this unflappable Frenchman finds himself in danger?